2019 Curated Exhibition: Inside/Outside: Images of the LAND in Artexte’s Collection, February 6 – April 13, 2019. 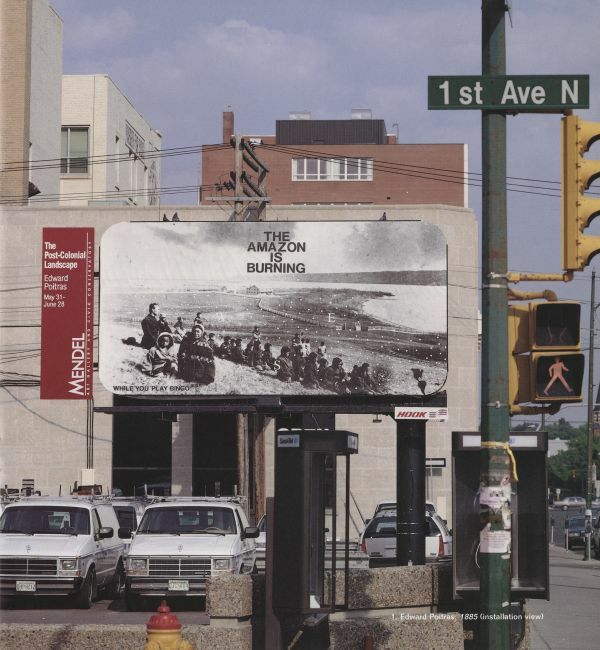 Long before the concept of the Anthropocene became a concern, artists in Canada were grappling with the country’s colonial and environmental history, using photography to respond to and express their social, emotional, or political perceptions of land. These traditions and visions, by confronting and feeding upon each other, have developed according to particular perspectives on land: an internal perspective, which seeks to bring forth experiential and subjective readings, as well as an external position of photographer as outsider, recording transformations as neutral or critical observer. In between, (inside/outside) lies work which explores the absences in the land, that takes the form of land reclamation, and aims to activate places within their histories of human and animal belonging. Through the exhibition, Karla proposes to situate the viewer within the social, cultural, and political land of Canada in 2018 by asking the question: are you inside or out? As a continuation of our shared research interests into the imaging and depiction of land-use and nationhood in Canada, Andreas and I will investigate the historic National Film Board of Canada Still Photography Division publication Between Friends (1976), produced as a gift to our southern neighbours, the United States of America, in celebration of the 200th anniversary of the American Revolution. Funded by the Canadian government, NFB SFD director Lorraine Monk employed twenty-six Canadian photographers who were sent along the Canada-U.S. border to produce images for the book. Our research will use a collaborative methodology to explore the history, influence and legacy of the project and will result in a number of different outcomes: an exhibition, a journal article, and an artistic book. 2018-2017 Research Fellow at Artexte Information Centre, Montreal, Quebec. This research project will explore how Canadian artists have engaged with and responded to the growing awareness of environmental crisis, as preserved in the collection of the Artexte Information Centre. Focusing on photographic traces in the collection, particularly the genres of landscape, nature, and eco-photography, my research begins from a point of curiosity about the evolution in Canadian artistic practices since 1965, as ideas about the environment have become more nuanced, critical, and interdisciplinary. I am interested in discovering how more traditional genres like landscape photography have been subverted or maintained by current ideas about the environment. Artexte’s collection of documents, while rich and varied, raise important questions about artistic access, authority, and institutional framing of the environment in Canada, as well as the role of the publication in shaping an understanding of Canadian artistic production. This research residency will provide me with the opportunity to explore these questions and bring to public attention some of the counter-narratives in Canadian landscape photography. As a medium with the ability to travel around the world at the click of a button, photography has become a ubiquitous visual companion to contemporary life. Photographs help us envision the planet, situating far off places and people in their historical, geographical, and ecological contexts. This book proposes the concept of “eco-photography” as a framework to investigate how photographic images help us to picture the global environmental imaginary. Photographs have been crucial to the development of the global environmental imaginary by visually representing the past state of the environment, presenting our world in its current troubling state, and articulating a sense of risk for the future. By coming to terms with the important role that photography has played in picturing the world and shaping our planetary consciousness, I argue that eco-photography has influenced how we understand the political, ethical, and scientific aspects of the current environmental crisis. Through a close reading of photographs that depict environmental crises happening around the world, representing not only the threat to nature but to human life, I provide a vocabulary and theoretical framework for understanding the significant impact that photographs have on our view of the global environment and our place within it.